Australian Galleries, Melbourne, Brett Whiteley `Lavender Bay Series' , 'The theme of this catalogue/exhibition is to present a series of work to celebrate the view from the artist's house at Lavender Bay on Sydney Harbour', Collingwood, pre 19 Nov 1974, (illus.). Modern Australian painting, 1950/1975 , Adelaide, 1980, 168 (colour illus.). Nancy Borlase, Bulletin , 'Art; An unexpected Whiteley', pg. 57, Sydney, 23 Nov 1974, 57. This is a review of a Brett Whiteley exhibition held at the Australian Galleries in Melbourne. Brett Whiteley is photographed with daughter Arkie. The Art Gallery of New South Wales Bulletin , Sydney, Feb 1998-Apr 1998, 21 (colour illus.). Maureen Gilchrist., Age , 'Talent shows in serious works', Melbourne, 20 Nov 1974, 2. This article appears in the `Art' section of `The Age', and is a review of Brett Whiteley's exhibition at the Australian Galleries, Collingwood, Melbourne. The theme of the exhibition is the view from the artist's home at Lavender Bay, Sydney. Jane Hampson, Look , 'Under the influence: the work of Lloyd Rees and Brett Whiteley hangs side-by-side in a new exhibition', pg. 12-16, Melbourne, Feb 2001, 15 (colour illus.). Patrick White, painter, manqué: paintings, painters and their influence on his writing , 'White and the Sydney Art World: 2', pg. 84-93, Carlton, 2002, 92, 156. Lou Klepac, Affinities: Brett Whiteley & Lloyd Rees , 'Introduction', pg. 2-4, Sydney, 2001, front cover (colour illus. ), 8. Alan McCulloch., The Herald , 'Back to Terra Firma', Melbourne, 20 Nov 1974, 30. This article appears in the `Art' section, and is a review of Whiteley's exhibition at the Australian Galleries, Melbourne. 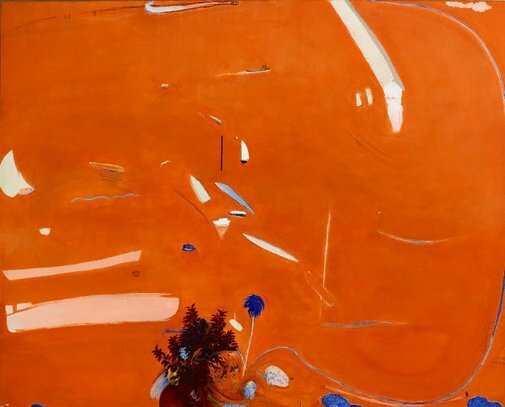 Sandra McGrath, Brett Whiteley , 'Lavender Bay: Optical Ecstasy', pg. 164-213, Kensington, 1979, 170-171 (colour illus.). Sandra McGrath, Sydney Harbour Paintings from 1794 , 'Brett Whiteley (b.1939)', pg. 100-103, Milton, 1979, 100 (colour illus. ), 101. W.E. Pidgeon., Sunday telegraph , 'Whiteley finds peace', Sydney, 22 Dec 1974, 59. This article appears in the `art' section of the `Sunday Telegraph', and reviews a Whiteley exhibition of recent works held at Bonython Gallery. Gavin Wilson, Harbourlife , 'harbourlife', pg. 7-32, Sydney, 2007, 56, 32, 32 (colour illus.). Menzies Art Brands Pty Ltd [Sydney], Menzies, Melbourne: Australian & International Fine Art 15 December 2010 , Sydney, 2010, 40, 43 (colour illus.). RELATED WORK: 'Little Orange (Sunset)', 1974, lot no. 27; NOTE: AGNSW work illustrated on page 43, related work illustrated on page 41.